Blue whales are perhaps the most evocative and spectacular of all the great whale species. The largest animals ever to have lived on earth, there’s an almost mythical quality surrounding these ocean giants. Hunted almost to extinction at the height of the whaling boom the species is thought to be recovering slowly. According to the IWDG species profile the North Atlantic blue whale population is estimated to be as low as 400 individual animals. But sightings of blue whales in Irish waters are on the increase. In September 2008 Ivan O’Kelly photographed a blue whale (the second confirmed Irish blue whale sighting, and the first to be photographed in Irish waters) offshore off Ireland’s south west. In September 2012 The Irish Air Corps got stunning aerial photographs of blue whales in the Porcupine Seabight area, and the IWDG research vessel, The Celtic Mist, also recorded blue whales in the same area. The most recent sightings come from September 2013, when Maren Reichelt and Mick Baines observed several blue whales over an extended period working as Marine Mammal Observers and Passive Acoustic Monitoring operators on a survey vessel working in the Porcupine Seabight area. 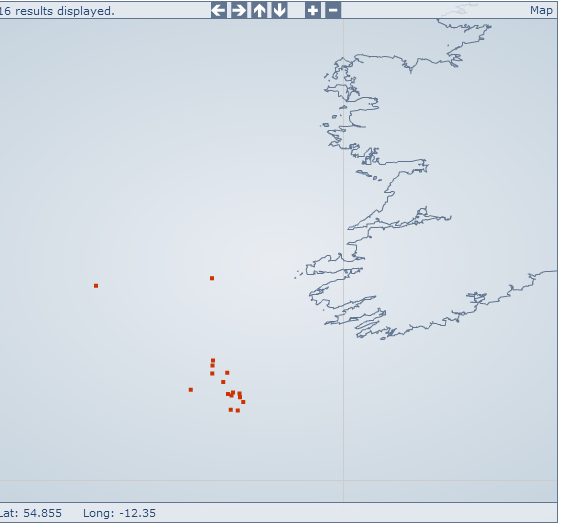 So it looks like blue whales are regular visitors to offshore waters off Ireland’s south west in the autumn. Whether this is a new phenomenon, or something that’s simply been going unrecorded until recently, I guess we’ll never know… but it is exciting to know these iconic whales are out there. The gallery below shows a small selection of blue whale images from last September reproduced here with kind permission frin Maren Reichelt & Mick Baines. For more stunning photographs of blue whales and other cetaceans from the Porcupine Seabight during Summer / Autumn 2013, and an amazing account of the wildlife they encountered, check out Maren and Mick’s blog.